I have a houseful of science geeks. I know that comes as no shock to most of my regular readers. Having the opportunity to review a science curriculum is always something to get excited about here. Especially when we're talking about something a little different than our usual (biology heavy) science fare. Bright Ideas Press has a pretty amazing series of books in the Christian Kids Explore Science series. A year and a half ago, we had the chance to review Christian Kids Explore Biology. For the past few weeks, we've been busy with Christian Kids Explore Physics, which we received electronically. This is the 2nd edition of this title, and it now comes with a Resource CD. Clicking on the "Start Here" file brings you into a pdf file that acts much like a web browser. You have choices to pull up lesson plans (each lesson is a single page, with two days worth of assignments), the reproducibles (no more trying to copy pages out of the book), supply lists (three pages, all together, incredibly easy! ), a literature guide on Ben Franklin of Old Philadelphia, a pdf catalog, or a button to contact Bright Ideas Press. I love the Resource CD materials. So now for the book itself. I'll be upfront and tell you I have some mixed opinions on the book. The website says this is for grades 4-8. I was initially using this with my two middle boys -- William, grade 7, and Thomas, grade 5. Richard, grade 2, ended up joining in as well. Let me talk about this book for my elementary kids, and then talk about it for my jr. high child. For Thomas and Richard, this book is great. My goals with elementary science are to expose kids to a variety of activities, approaches, and ideas. I adore using biographies in science, and lesson 3 of Christian Kids Explore Physics is about physicists, with the suggestion to read biographies. We've spread that out over a lot more weeks than just week 3. As a single book, this is great for them. 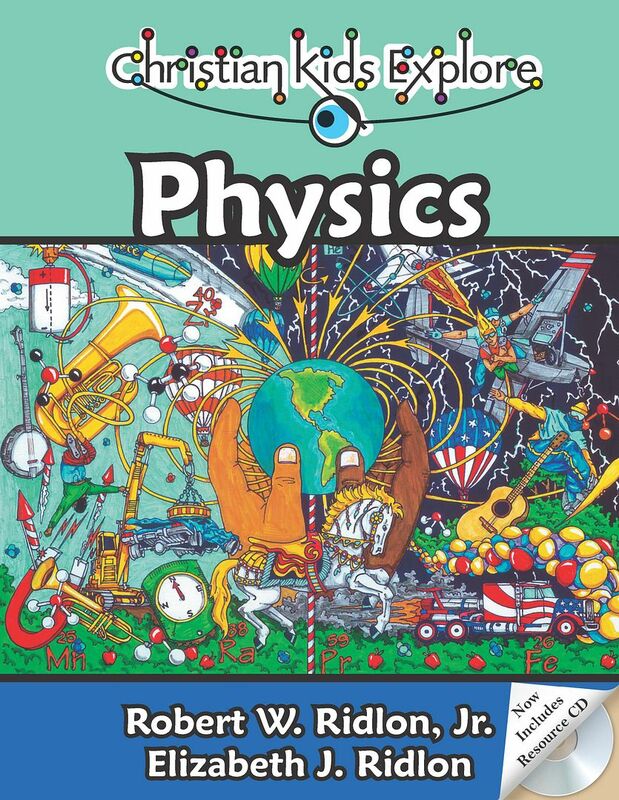 Unit One introduces some basic physics information, including the great stuff about physicists. Unit Two goes over Matter. One issue I have with this unit is the similarity to Christian Kids Explore Chemistry, however this information is important. We especially liked the atomic physics part. Unit Three is on Mechanics. We haven't gotten this far, but in looking ahead for purposes of this review, this is where the book gets really good. Unit Four is Matter in Motion. This is where you get into things like Newton's Laws of Motion. Fun stuff. Unit Five is Energy in Motion. You get the chance to learn about radio/tv, heat, music, etc. Also a lot of fun. Unit Six is Electricity and Magnetism, my least favorite physics section. Fortunately for me, the section is short. Unfortunately for me, my boys love the electricity part of this and will want more. As part of the series of Christian Kids Explore Science, I worry a bit about whether the kids would do okay with Unit Two if they have just completed Chemistry. Not the case for my kids though. My only other concern with this book for elementary ages is some of the hands-on portion. A number of the lessons have as their only hands-on activity a word search puzzle. I can understand that for the lesson on x-rays (not something I want my kids experimenting with!) or the lesson on physicists. Though I assigned a research project for the physicists. But couldn't we do something actually hands-on for the lesson on electricity and for the lesson on Newton's laws? Well, we will. Like my kids would let me get away with them not doing hands-on for these topics. (I told you we are science geeks!) I just wish it was included already. Overall, I love this book for them. Junior high, though? For William, we're dropping this. I think by junior high you should be expecting something a bit more rigorous. The hands-on is great, the overall scope is great. But there is something. Well, let me give you an example. In Lesson 2, the topic is measuring. Critically important topic in physics and I am glad it is there. The basic concept of the lesson is to understand the essential measurements needed in physics. Speed, dimensions (length, width, height), distance, volume, temperature and weight. I thought the definitions were a little casual, but I was okay with that. Until I came to the definition of temperature. Per the book: "A measure of how hot or how cold something is. Temperature is measured using a thermometer." Okay, yes, that is true. Essentially. But in physics, temperature means something a bit more technical. My 2nd grader commented on it when he saw my face scrunch up a bit as I was reading the definition aloud. I had decided I was going to read the complete section on temperature before adding any editorial comments. My 8 year old interrupted me though. "But Mom! Temperature measures how fast the molecules are moving around, which isn't exactly the same thing as how hot or cold something is!" I don't know if temperature is addressed in more depth later. I scanned the book and I haven't found it. But for a junior high student, I think the definitions ought to be scientific ones, not everyday usage ones. The discussion on weight bothered me too. A couple sentences about weight vs. mass, and I would have felt better. Of course, most people would probably not be so nit-picky. The other thing is that we are considering continuing with Christian Kids Explore Physics, and just working a bit more heavily with the recommendations in Appendix A: Book and Resource List. I've linked (click on my name). Thank you so much for such a detailed review of the Physics book. I found it quite helpful. I was strongly considering buying it, but since it's so new, I hadn't found many reviews of it yet, so I was somewhat hesitant. My kids are in 4th and 5th grades and we haven't done a ton of in-depth science (except Astronomy---my husband is an astronomy major). He's thrilled I'm going to be doing physics. I think this will work well for us. Thanks again! We ended up not using this book after all--and I've removed the review on our blog. Apologies to anyone trying to find it.